We perform a wide range of general surgeries at the Cat Clinic, including spay, neuter, intestinal foreign body removal, biopsy of abdominal organs, tumor removal, bladder stone removal, and amputation. 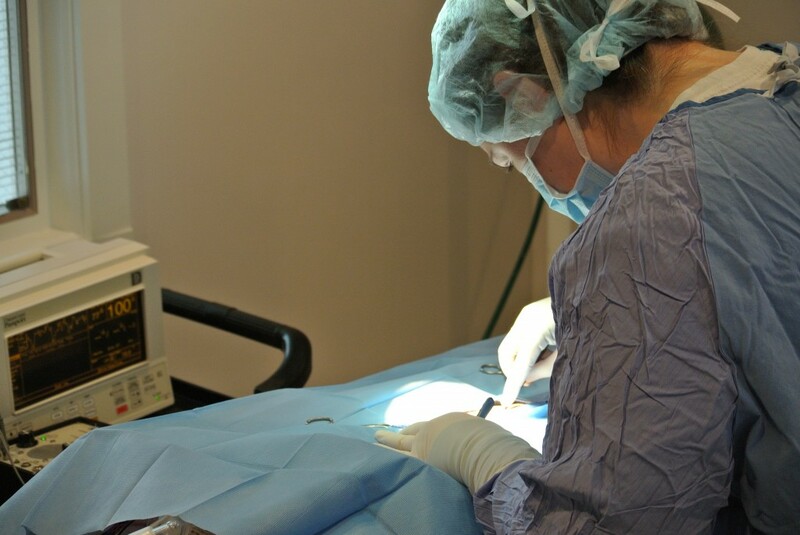 If your cat needs surgery, you can be assured that we pay attention to detail through every step, from the pre-anesthetic work-up through recovery. Pre-anesthetic Blood Safety Screen – Our on-site laboratory lets us screen for hidden problems before your cat’s treatment begins. These tests also provide a baseline for monitoring your cat during surgery, and can indicate chemical imbalances that could affect your cat under anesthesia. All of our anesthesia patients will receive this test before surgery. Anesthesia – The Cat Clinic of Lawrence uses the same safe isoflurane gas that is often used in human medicine. Isoflurane is primarily eliminated through the respiratory tract rather than through the kidneys or liver. This reduces the risk associated with anesthesia and allows for a quick recovery. Sterility – We have a dedicated operating room for surgical procedures. Sterile technique is followed, including sterile gowns, gloves, and instruments for every patient. Your cat will likely have a funny haircut afterwards from shaving and scrubbing of the surgical site. Monitoring – Your cat’s blood pressure, temperature, heart rate and rhythm, respirations, and oxygen levels are closely monitored by veterinary technicians using state-of-the-art equipment. We use a range of techniques and equipment to help maintain your cat’s body temperature while under anesthesia. Intravenous catheter with fluids – Administration of intravenous fluids helps the patient recover more quickly from anesthesia, maintains blood pressure, and increases circulation during anesthesia. The intravenous catheter is also used to administer medications if needed. In order to place this catheter, a small patch will be shaved on your cat’s front leg. Pain management – Your cat’s comfort is very important to us. We proactively control pain associated with any procedure with appropriate pain management medications.